“All the dignitaries on the dais, guests, parents, faculty, students, brothers, sisters and friends from the Media. 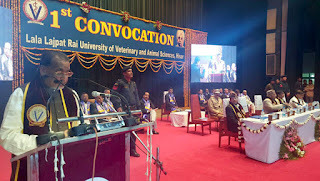 I take pride to be here to deliver Ist Convocation address of Lala Lajpat Rai University of Veterinary and Animal Sciences, Hisar. Today is a memorable day as we are celebrating 151st birthday of great freedom fighter, Lala Lajpat Rai Ji. First of all, I convey my heartiest congratulations to all the graduates, post-graduates and doctorates for successfully completing their degree, programmes and also to their learned teachers who have worked hard to enrich the young minds with quality education, knowledge, skills and moral values. I also greet all the parents who have inspired their children towards veterinary studies and provided them the resources and environment for their growth. My greetings to all of you. Which means with knowledge, I am the mover of tree of the universe, my fame rises high like mountain peak, I am the brightest treasure, I am the shining wisdom, I am immortal and un-decaying. Indeed knowledge is the source of energy for well being of humanity at large. The University is place for genesis of bright and intelligent ideas. But the real knowledge is one which not only serve the cause of humanity but every life on earth and to say it with pride who else can understand the meaning of life better than you, the veterinarian. o Persevere to realize the great achievement. The inception and growth of this University is closely weaved with the narrative of rural empowerment through animal husbandry services. For us, the sketch of empowerment is not just economical but social and educational upliftment of people across the state of Haryana. The Veterinary College has a glorious history as it is an off-shoot of the first veterinary college of undivided India established in 1882 in Lahore. It is backed by an enviable tract record of academic excellence, cutting edge research and rendering quality services to the livestock of the state. An extensive network of alumni occupying important positions throughout the world is a source of inspiration, enthusiasm and commitment to hard work for the faculty and students. LUVAS has several firsts to its credit and it has left its mark in research, education and extension. I am very proud and congratulate you all for continuing the legacy under the able leadership of Maj. Gen. (Dr.) Shri Kant, SM VSM (Retd. ), the first regular Vice Chancellor of LUVAS. Befitting the occasion, I would like to speak on animal wealth and how to leverage it for improving the prosperity of small farmers. I would like to highlight the role of animal farming in the lives of the small farmers and weaker sections, its contribution to the economy and the ecology. I would like to pay my respect to the teachers of this university for their untiring efforts in bringing this university on world map. Remember the words of Gandhiji, as you pursue your own careers. Gandhiji has once said, “Just as some of the experiments in your laboratories go on for all the twenty-four hours, let the big corner in your heart remain perpetually warm for the benefit of the poor millions.” Spare a thought for those not as privileged as you to have graduated from such an elite Institution. Think about the poorest of the poor and dedicate yourself to help the poor farmers. The last few decades have seen the Indian livestock sector emerging as one of the fastest growing sub-sectors of agriculture. However, the poor, both as producers and consumers, have been largely by-passed by the benefits of this growth. Both central and state governments have shown the will to reshape livestock sector policies and programmes, so as to promote a more inclusive form of growth and tap into the poverty reduction potential of livestock sector development. India has world’s largest animal wealth. As per the 19th All India Livestock Census, total livestock population in the country in 2012 was over 512 million, largest in the world, despite decline of 3.33 per cent over 2007. In addition to this, poultry birds and fish further appreciate the wealth we have. Livestock as source of draught power has declined considerably due to mechanization of agricultural operations and declining farm size. Their importance as a source of quality food has increased due to sustained income and economic growth, a fast growing urban population, burgeoning middle class, changing lifestyles, increasing proportion of women in workforce, improvements in transportation and storage practices and upcoming supermarkets, especially in urban areas. The Government of Haryana has recently passed the Haryana Gauvansh Sanrakshan and Gausamvardhan Act 20, 2015 in which it is stated that the government shall establish laboratories for differentiation of beef from that of the meat of other species of animals, testing and identification of various constituents of milk and milk products and testing and differentiation of A1 and A2 milk for providing incentives for wholesome production of milk and milk products. I am delighted to know that LUVAS has already taken the lead role in differentiating cow meat from buffalo meat besides testing milk and milk products. India is the largest producer of milk in the world. India produces 13.1% of the total milk produced in the world. Per capita milk availability is 252g per day lower than world average of 265g. India stands 5th in egg production, 18thin broiler. The growth rate for poultry sector is 8-10% p.a. The demand for milk and milk products is projected to increase to 142 million tonnes, consumption of eggs is expected to increase to more than 81 billion, 10.9 million tonnes of meat and 11 million tonnes of fish by 2020-21. The milk production in Haryana in 2014-15 has touched 79.01 lacs million tonnes making per capita availability of 805 gm second highest in India. But, the livestock sector faces many challenges like low productivity, inadequate feed and fodder availability, prevalence of animal diseases, climate change, degradation of natural resources, knowledge gap, inadequate infrastructure for marketing and processing of value added products, issues relating to bio-security and sustainability. In order to address these major challenges, the Central Government has framed National Livestock Policy in the year 2013. The primary focus of the policy is to increase livestock productivity and production in a sustainable manner, while protecting the environment, preserving animal bio-diversity, ensuring bio-security and farmers livelihood. The National Livestock Policy would facilitate better inter-state coordination in control of animal diseases many of which are zoonotic, regulating export and import of livestock and livestock products, enhancing availability of feed and fodder, bio-security and conservation of indigenous breed, which are essential for development of livestock sector. I am happy to know that LUVAS has signed eight MoUs with National and International public and private institutions during the period 2011-14 and hope the MoUs would be functional and yield productive results. Signing of MoU with world class Pirbright Institute, U.K. is testimony of LUVAS’s excellence in scientific capabilities and is first of its kind. The commercialization of technologies for their faster transfer to the stake-holders and also to realize return on investments has become part of technology transfer pursuits. I have been told that LUVAS has also established “Business Planning & Development Unit and IPR Cell” for patenting and licensing of technologies which will help not only the farmers of Haryana but of other states as well. I am happy to say that Haryana has taken the lead in whole country in moving towards containment of Foot and Mouth Disease (FMD) by the combined efforts of LUVAS and State Animal Husbandry Department. The role of Regional Research Centre on FMD in LUVAS is really praiseworthy in achieving this target. We have an enormous and diverse animal wealth that generates primary as well as supplementary livelihood opportunities for millions of people. Are we able to tap this wealth for the benefit of the people involved in rearing and tending them as also the consumers who demand the produce from animal farming activities? I am happy to know that after putting years of research, the university has contributed in development of a new breed of dairy cattle ‘Hardhenu’, which is a crossbred of Holstein Friesian, Hariana and Sahiwal. The beneficiary of such research work will be our poor farmers. I have been told that LUVAS organizes trainings on Dairy Farming at different places in Haryana. Hundreds of livestock owners/ un-employed youths, both men and women participate in these trainings and get direct benefit from our scientists. Inter-institutional networking and partnering with rural people is of immense value to take the benefits of policy and developmental programmes to people. In this context, I recall the words of the Milkman of India, Dr. Kurien, "India's Place, in the sun, would come from the partnership between wisdom of its rural people and skill of its professionals." LUVAS has well demonstrated strengths in research, education, training and extension. I am happy to note that LUVAS has developed technologies for the manufacture of a variety of indigenous dairy products, formulated foods and health foods. It is heartening to note that LUVAS has developed ties with industry and most of its technologies can be commercialized. On both counts, institutions like LUVAS can guide the policy makers and help reach the target population through its extension activities. Research and extension can help redesign policies which can reach out to the people. Thus, LUVAS can strive for sustainable and diverse livelihoods, better technology development and adoption, and nutritional security of our people. Dear students, as we celebrate your accomplishments today, remember there is no room for complacency and for mediocrity. Remember, life is not bed of roses, you are likely to encounter setbacks at various stages, do not let these discourage you. Experiences decrease our mistakes and mistakes increase our experience. Learning is a lifelong process. I would like to emphasize that education is not merely getting good grades or academic awards. A good education system has to provide value based education which will lead to good society. Education must focus on tools to unfold minds for cultivating and inculcating curiosity, learning, creativity and independent thinking, imagination and shaping the students as universal human beings and useful citizens. Institutions must ensure overall development of students for facing global challenges. For that, we have to get out of our comfort zone. One of our Beloved President of India late Dr APJ Abdul Kalam in his book ‘Scientific Indian’ says “The livestock is good source of employment and income for farmers. For most of marginal farmers it provides over 70 percent of their supplementary income. Regular employment in this sector is about 5 percent of the main workforce in the country”. This gives an account of importance of livestock sector in Indian economy. For continuous and sustained growth of this sector valued human resource is indispensable and I believe that LUVAS through these graduates contribute to this National cause. Lastly I would like to bring your attention that 2016 is centenary year for Pandit Deendayal Upadhyayji’s birth, his vision of antyoday will not be accomplished without empowerment of poor and marginal farmers. In present Indian context animal husbandry can, at large, fulfill the dream of social and economical inclusion of last man at row. As per preliminary reports received from the States, the total area sown under Rabi crops as on 28th January, 2015 stands at 591.51 lakh hectares. Wheat has been sown/transplanted in 292.52 lakh hectares, pulses in 139.08 lakh hectares, coarse cereals in 60.08 lakh hectares. Area sown under oilseeds is 77.43 lakh hectares and Rice is 22.41 lakh hectares. The Director, Animal Resources Development Department, Government of Tripura informed this Department on 14-01-2016 about the unusual mortality in State Poultry Farm, Gandhigram, Tripura West district of Tripura State. The samples were sent to National Institute of High Security Animal Diseases (NIHSAD) on 14-01-2016 which were found positive in RT-PCR and Real time RT-PCR for H5N1 AIV. Keeping in view the revised action plan, the intimation of the result was given to the State by NIHSAD, Bhopal for starting the control and containment operations so as to avoid the further spread of the disease. The Director, Animal Resources Development Department, Government of Tripura was requested to send a report on the matter and take necessary measures as per Action Plan on Avian Influenza. The State government carried out control and containment operation at the epicenter which was over on 25-01-2016 and the State issued the sanitization certificate for the said epicenter on 25-01-2016. During the operation, 7687 birds were culled while 1760 had died out of a population of 9447 birds in 1 km. radius. The Department has issued the Post Operation Surveillance Plan (POSP) on 27.01.2016 which will be continued for a period of three months from the date of issue of sanitization certificate.